I went to public school during the early progressive years of the 1960's, in the most progressive town, Mill Valley, California, which meant that a solid foundation in grammar was being removed from the public school curriculum about as fast as I was growing up. I remember having only one grammar class during my entire public school education, and that one class began in the third grade, when I was at the end of my seventh year, which also meant, according to current research on child development, that I was developmentally immature for an analytical subject like grammar. Grammar was a puzzle to me from the start, and I did not like it. Nothing the teacher said made sense. Spot was a dog, not a noun, and wanting to know why Spot was running was the extent of my seven-year-old interest in verbs. I never did learn much grammar back then. I remember wanting to study French in high school, inspired by my older brother who was living in France at the time, and so my freshman year I signed up for a French language class. When the results from my first test were handed back to me, I wanted to hide under my desk. The grammar had tripped me up, and I knew it could only get worse, so I dropped the class. It was obvious that I would have to learn French some other way. To be brutally honest, I always felt a little stupid for not knowing grammar after my experience in high school, and that feeling lurked in the minuscule brain cells that governed my memory for years. Later, I went on to study the sciences and completed a Master's degree in Chinese Medicine. But when I finally settled down to raise a family and homeschool my children, I again came face-to-face with my foe. Rather than feel incompetent, this time I felt determined. After all these years, I was finally going to conquer my ignorance of English grammar, and there was no doubt in my mind that I would succeed. By then, I had discovered the strength and power of my own mind, something that my public school experience had kept hidden from me for year. And by now you're probably wondering, "How did you teach grammar to your children if you didn't know much yourself?" That's how I taught grammar, and that's how I learned to love grammar. Little did my kids know that as they learned, I learned beside them. I kept a poker face while I taught them. I acted like I knew exactly what I was talking about. As an adult, the basic grammar they were learning was easy to understand, so I wasn't really bluffing, but still, I didn't want to let on that I knew less grammar than they thought I did. I would have lost all credibility, so I was careful to stay one step-ahead of them. That's all it really takes to teach a subject you don't know well to a grade school student. If you can stay one step ahead, they'll think you're a master of the subject. From their tiny perspective, you are. It happened during my seventh year of homeschooling to be precise. I'll never forget it. I was at the head of the dining table with my son to my left and my daughter to my right. She was doing the exercises in her seventh grade grammar book. 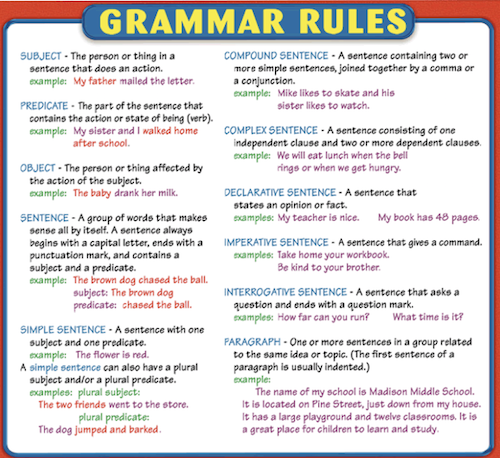 By the way, if you're not familiar with the Rod and Staff publishers, please understand that their seventh grade grammar book contains more grammar than most people today know by the time they graduate from college with a Bachelor's degree in English. And lest you should wonder, I tell you this story not to humble myself, but to demonstrate that no matter how much your own public school education failed you—you can teach yourself, you should teach yourself, and you will teach yourself when you homeschool. Which is another important reason to homeschool. And, on a purely selfish level, it was my favorite homeschooling perk. As anyone with older children knows, your children reach the age of discernment, and they begin to notice your flaws. Suddenly you're not the perfect parent anymore. And they catch on to more and more of your imperfections the older they grow. To continue my woeful tale, it was the parenthetical phrases that betrayed me. Which ones get a comma and which ones don't? They still trip me up, even today. As we were enjoying our grammar session, my daughter got tripped up by one too. She looked to me for guidance. Only I didn't know the answer to where that lilliputian comma went. I put on the face of one who did know and pretended to be a little side-tracked as I quickly scanned the page in the grammar book desperately looking for the answer. "Mom, you don't know the answer, do you?" she said with a mischievous twinkle in her eye." "Well, it's temporarily slipped my mind, if you must know." The twinkle was still in her eye as I saw her process the truth of the situation. She knew as much grammar as her mother did, and her mother knew as much grammar as she did. The grammar became more challenging in seventh grade, and my aging brain was no match for her young, vibrant, three pounds of grey and white matter doing gymnastics between her ears while mine could barely sit up. She taught herself through most of her seventh grade grammar book, and that was when I knew that I had succeeded. My daughter had successfully learned how to teach herself. It wasn't that she hadn't taught herself anything before, but she had now tackled her first difficult subject alone, and for the most part, successfully. And a couple of years later she was teaching other homeschooled children grammar. In my defense, I did eventually catch up with her. I just needed to do a lot more sit-ups first. It was during the time I was teaching my children grammar that grammar and I slowly became friends. Eventually, I even learned to love grammar. There's no deep metaphysical realizations or self-revealing truths to share with you (I'll save that task for greater minds! ), only that through homeschooling, I discovered the joy of playing around with words and sentences, and of trying to figure out how all the pieces fit together, and to fit them together in the best of ways. There's something precise about grammar, with all its rules; a certain comfort that comes with knowing exactly where everything should go. But there's also the spirit of language that emerges with a deeper understanding of the rules; the intentional breaking of the rules in deference to the art of using language well, and that's what a seasoned orator or writer can do. They can break the rules. To join the launch of my new course, How to Homeschool the Smart Way, please visit my webpage where you'll find all of the course details and the registration link to join. The course begins this coming Saturday, August 4, 2018.